GroPro, which normally costs $1,490 is now discounted to $1240 ($250 off). GroBox, which normally costs $2,490 is now discounted to $2,240 ($250 off). To get their $250 discount, users must use Promo Code ‘HOLIDAYZ’ at checkout. The GroBox and GroPro are made in America, and ship out of Cloudponics’ San Diego fulfillment center. 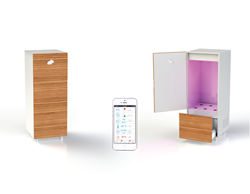 The GroBox intelligently monitors and manages multiple variables such as air temperature, nutrients, humidity, water levels, airflow, light schedule and pH balance in order to create and sustain the optimal conditions for consistent, predictable, and repeatable yields. The GroBox can be paired with the Cloudponics app for 24/7/365 oversight and can run for up to three weeks before a water refill. Which means it’s easier to kick-back and relax during the high-stress holiday season. The GroBox is simple yet adaptable to the grower’s level of experience. From a beginner to an expert, anyone can cultivate their own high-yielding, high quality cannabis plants in about three months' time from the convenience, comfort and safety of their home. The GroPro intelligent controller automates existing grow rooms by monitoring variables such as air temperature, humidity, nutrients, pH, light, water temperature, and controlling these by dosing nutrients and pH adjusters, as well as controlling heater, humidifiers and extraction fans. Just like the GroBox, the GroPro is controlled via the Cloudponics app. For additional information, please visit http://www.cloudponics.com.